This past week I had to go back to work. SIGH. Monday I drove two hours with one of my yearbook student editors to attend a Jostens yearbook workshop. It was very helpful in giving me steps for teaching this class, since I have never done it before. We got to see different ways to lay out a page, cool methods of marketing with social media, and a chance to begin to design our cover for the 2015-2016 yearbook with a professional designer. I also got to know my new editor. She is eager to do a good job – and she’s a junior, which means she can carry over her leadership experiences her senior year. It was a great day – but leaving the house at 6:30 AM and getting back around 8 PM after two whole months of lazy 9 AM wake ups…oy! The workshop also helped me brainstorm what I want my yearbook class to look like. Right now I have 17 students enrolled – all juniors and seniors, and only three who took it last year. This is a bigger class than in the past, and I speculate that with so many students, there may not be enough work for a yearlong class. I did the math – a 200-page yearbook divided by 17 means roughly 11 pages per student, or about 5-6 “spreads” (2 page layouts). Or basically, 1-2 “spreads” per quarter – not nearly enough work for a daily class. I could be very wrong, but I’ve got some new ideas I want to try. My school used to have a newspaper class, but in the age of declining newspaper subscriptions and loss of student interest, the class has slowly drifted away and isn’t offered this year. I’d like to rename my class to “publishing” from “yearbook.” I have been in discussions with the school’s communications manager to possibly devote a section of our website to become our online newspaper/blog, and have my students publish stories about the school on a weekly basis, then pull from these stories to create the yearbook at the end of the year. This way we would have more opportunities to share photos and stories that don’t have room in the yearbook. We could feature a staff member of the week, or a student spotlight. Games could get covered individually. Very few people read the stories in the yearbook, but they read the stories in a school newspaper; this gives a greater sense of authenticity to my student-writers, and a wider audience on a story shared with the school’s 4000 Facebook followers than just the 500 students who get a yearbook at the end of the year. I want to take my students on a tour of our local newspaper, or at least bring in some guest speakers from the local community to talk about deadlines, time management, and marketing. I want to work closely with the video department, the photography class, and the business class. I’m excited to make this class not the easy-A elective I’m afraid it might be and instead make it a class students have to apply to and get excited to be in. Tuesday evening and all afternoon Wednesday and Thursday we hosted students and parents for registration. 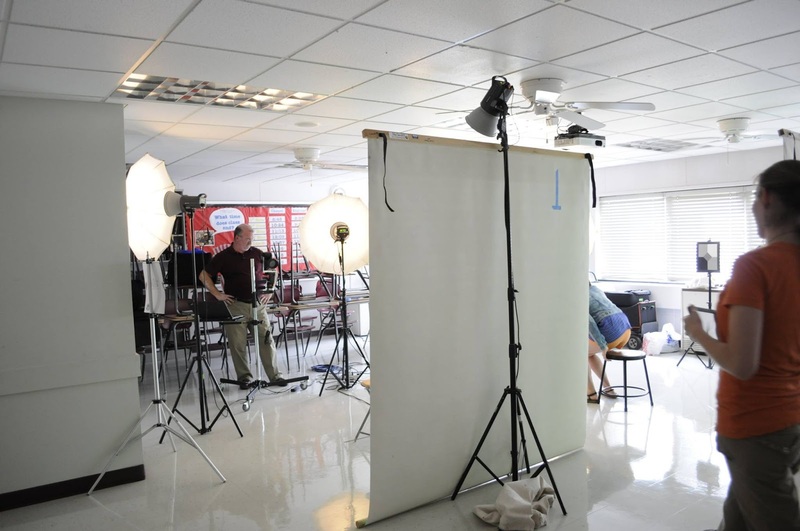 I was set up in a [non-air-conditioned] classroom with the two photographers taking school pictures. This was a change from last year; they used to take pictures during school, but this way we avoided dress code violations and parents could see the pictures before ordering them. Overall it was received well; I was nervous, as change isn’t always liked. There were a few parents who didn’t know about the change that were a little upset, but I promised them retakes in September and that seemed okay. I’m on the right – a candid of our little registration photo set up. I also represented the yearbook. As I’ve started to go through the yearbook room, I’ve discovered dozens of extra copies from the last several years (we have over 70 extra from 2014 alone). I found an old library magazine rack, the kind with a display shelf to lay out the most recent and shelves underneath to stack other issues, and I displayed extra copies of the 2012, 2013, 2014, and 2015 yearbooks with a sign offering them for sale. I sold twelve books during registration. That’s twelve books no longer taking up space in the yearbook room, and over $250 now in my yearbook budget toward things like a bus to take us on a field trip to tour the newspaper, or a new camera. Yay! I will advertise old books at Homecoming too and see if a few more can find loving homes. I’m learning how to set up offers for business ads and senior recognition ads through the Jostens website, and how to manually keep track of orders parents made with checks at registration. My editor took pictures at registration and I asked her to write up a short story on it, so maybe that can be the first story on our new online blog. My Jostens rep is extremely responsive to my numerous questions I pepper him with. After feeling nervous all summer that I didn’t know what I was going to do with this class, I’m now excited to meet the staff and get to work. I think it is going to turn out to be really cool. Sometime this week I have to figure out what I’m doing with the rest of my English classes. You know, the ones I was originally hired to teach! Actually, I met a lot of my AP junior and freshmen students at registration too, and I think I’m going to have a great group of students this year. I might have to modify some of my curriculum because I missed the deadline to order new books for next year – I’ll have to use what’s in the book room – but that means I’ll get to read new books, which is never a bad thing. I am exhausted from the week of actually working, and sad to have to wrap up my fun summer with Hubster and Spartacus (he took a few steps this week – and then realized what he was doing, freaked out, and hasn’t done it since). But I’m excited for the upcoming school year, spurred on by the Target back-to-school ads. This past week I had to go back to work. SIGH. But you know what? Even in my exhaustion and my stress over not being “ready” (I never will be, ever), it felt really good.